WASHINGTON -- A billboard urging people to "Vote American" and support Kansas Republican congressional candidate Mike Pompeo is igniting controversy in the state's fourth congressional district, with the campaign of Raj Goyle accusing its opponent of launching "bigoted attacks." On Saturday, the Goyle campaign sent out an e-mail to its supporters, asking them to sign a petition calling on Pompeo to have the billboard taken down. The campaign also sent a letter to its Republican opponent about the issue. "It's pretty obvious what they're trying to say there," said Goyle Campaign Manager Kiel Brunner. "I don't know that it's going so far as a 'birther' thing, but it's not the first time they've said something like this or been open about it. And whether or not it's in the collusion with the Pompeo campaign, they apparently attract supporters and contributors who support this, and anything less than a denouncing of the tactics is unacceptable." In response to an inquiry from the Huffington Post, Eck said he was not referencing anything about the ethnicity of Goyle, whose parents immigrated to the United States from India. "I just like the word American," Eck responded in an e-mail. "No intention of any inference that Mr. Goyle is not American. I really don't know him, but I'm sure he is American and I would be surprised if he doesn't use the word (American) in his ads. Since I had a couple of other emails inferring this, I plan to eliminate the words (American) from the billboard this afternoon. I show a sign of the American flag flying each day in rotation and just like to use the term American. If I was supporting Mr. Goyle for our District, I would have used the same word for him." 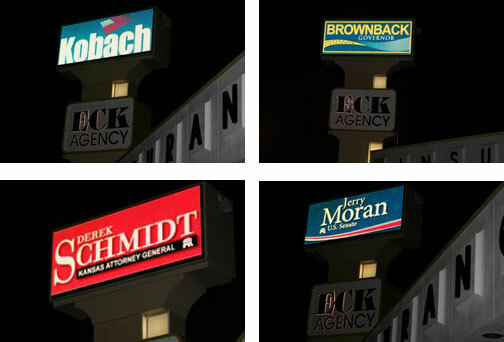 In a follow-up e-mail, Eck said that he unplugged the billboard on Sunday. "Regardless of the outcome of the elections next Tuesday, everyone needs to feel they are Americans," he wrote. 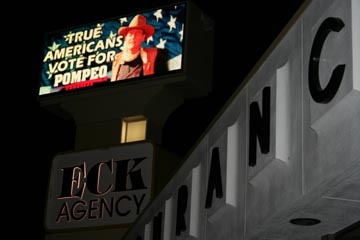 "'Vote American Vote Pompeo' and 'True Americans Vote for Pompeo' are intentionally offensive which is why he is changing the billboard," responded Brunner. "It's sad that Mr. Eck thought he could fool the voters of Kansas. It's even more sad that Mike Pompeo continues to hide behind his supporters' bigotry throughout his campaign." 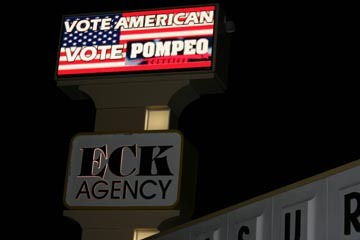 There doesn't appear to be any evidence that the Pompeo campaign was at all involved with the billboard. Pompeo's press secretary did not return an inquiry from The Huffington Post. This incident isn't the first time that Goyle's ethnicity has come up in the campaign. In August, Pompeo's Twitter feed promoted an article that called Goyle a "turban topper." His campaign apologized, saying the post was "tremendously offensive" and attributed it to an error in hyperlinking.